We had great music at Deep Roots--but if you were craving some southern rock/ country music--we've got it for you. 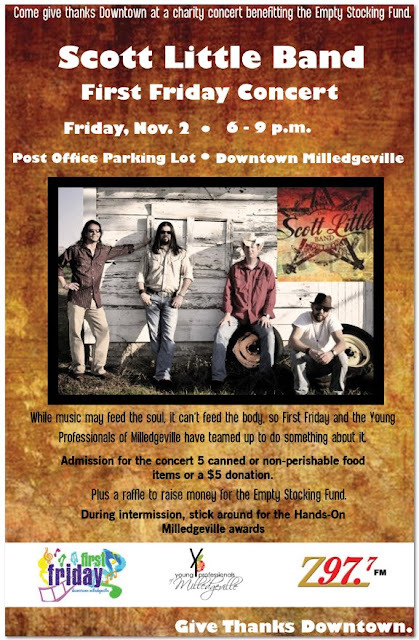 Come downtown this Friday night for a jamin good time in the 'Ville starting with "Sol Junkie" and wrapping up with the "Scott Little Band". It's a charity concert for First Friday--just bring 5 cans of food or $5 --it's all going to the Empty Stocking Fund--and enjoy some great music in the parking lot next to the post office in downtown Milly. We hear Main Street will have the usual kids activities, art and more--and don't forget the stores will be open late and the restaurants will be ready for you too. Be sure you stop by OCT and check out our vintage goods--we love First Friday's and we love downtown Milly--so see you there! Here's is a little sample of "The Scott Little Band" but you need to come hear them in person!